Can the Green Revolution be repeated in Africa? Almost every country that has become wealthy started with a huge increase in farming productivity. Chart 4 shows the increase in output per acre for various grains, including wheat, corn, and rice, in the United States, India, China, and Africa since 1961. This dramatic increase in output—more than three times—is often called the Green Revolution. The Green Revolution, and the Rockefeller Foundation’s role in the research that enabled it, is frequently cited as one of philanthropy’s great success stories(1) and a huge contributor to enormous reductions in poverty. (2) Yet as Gates continues, “Africa jumps out as the only case where this [revolution] has not taken place.” Why? African countries have widely varying climate conditions, and there hasn’t been the same investment in creating the seeds that fit those conditions. Because agriculture is an essential part of economic growth for most African countries, we are working with others to fund a “Green Revolution for Africa” and other areas that could benefit from this kind of investment. Gates gives the impression that bringing the Green Revolution in Africa is mostly a matter of repeating what’s worked elsewhere, which would make it an excellent fit for our priorities. But from the rough analysis we’ve done, it appears that there has been at least as much effort to bring about a Green Revolution in Africa as elsewhere, and the obstacles in this area are specific and significant. For context, sub-Saharan Africa accounted for 20-30% of the world’s extremely poor in 2003, up from 14-19% in 1990. 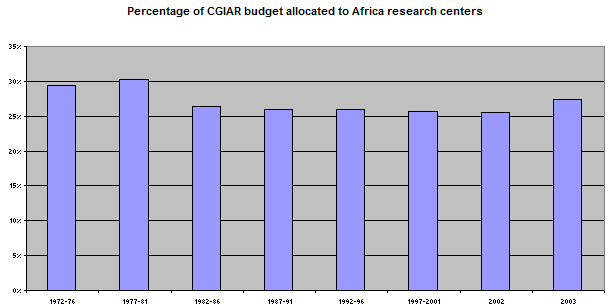 (5) It certainly seems from this rough cut that funding for relevant research in Africa was in line with funding for relevant research in the rest of the world. He started working in Mexico in 1944 (pg 4); “By the late 1950s the cooperative program had made such a contribution to Mexico’s food production that … Borlaug had succeeded in working himself out of a job” (page 3). He entered India in 1967, and within 10 years India had gone from threats of famine to self-sufficiency (page 3; see also the account of the Green Revolution given by the Library of Congress’s Country Studies/Area Handbook Series). He has been working on bringing similar benefits to Africa since 1985 (pages 6-7) – far longer than he worked in either Mexico or India. Agricultural prices have fallen drastically (in real terms) since the original Green Revolution. The benefits to increased crop production may therefore not be as great. Africa’s environment, with its high disease burden and difficult climate, presents special – and possibly greater – challenges compared to other environments. Much of Africa has low population density and extremely weak infrastructure (including railroads, irrigation and electricity). African governments are not providing the sorts of subsidies that Asian governments used to encourage agricultural output. None of this means that bringing the Green Revolution to Africa is necessarily impossible, or that aiming funding at this goal is necessarily futile. But it’s important to recognize that this goal is a formidable challenge for which no strong precedent exists. The prospect of an African Green Revolution is extremely appealing, but we don’t feel that this sort of investment can ultimately be counted as “proven and scalable,” and we don’t feel it’s as well-suited for individual donors as many health interventions (which are both proven and likely repeatable, and have simply not been funded enough to reach full coverage – more on this in a future post). (2) “The green revolution, which accelerated growth from the 1960s, beginning in India and Indonesia, was a major factor reducing poverty in Asia, as documented by numerous studies (see, for example, Rosegrant and Hazell 2000; Timmer 2002; Lipton 2004; Datt and Ravallion 1998a, 1998b). ” From “Agriculture, Rural Development, and Pro-poor growth” (World Bank 2005) pg 15. (3) Based on a reading of the Rockefeller Foundation’s history (note 1 gives two examples of the Rockefeller Foundation’s being credited with a primary role in the Green Revolution). (4) Data, sources, and calculations available here (XLS). (5) Based on the proportion of people living on $1/day or less and $2/day or less, as reported on page 60 of the World Bank’s 2007 Global Economic Prospects report. (6) See Borlaug’s Nobel Peace Prize bio and the opening statements/summary of the Center for Global Development’s event on “The Prospects of Bringing a Green Revolution to Africa”.